Quite a few years ago, we had dinner with some friends and they made a wonderful sausage dish that can easily adapted to what you have in your fridge. It works really well with peppers, onions, zucchini, but also could go with mushrooms or eggplant. Feel free to change it to suit your own family’s tastes. It looks lovely over tri-color Rotini Pasta. Bring a large pot of water to boil. Cook the pasta according to package directions. Heat a large non stick skillet, over medium high heat. Add 1 Tbsp of cooking oil to the skillet and brown the Italian sausages, turning from time to time to brown until cooked through. Remove the sausages and set aside. Add a little more oil to the skillet if needed. Saute the onion, bell pepper, and zucchini until the onions are translucent and the vegetables are cooked to your liking. Add the diced tomatoes and tomato sauce. Heat through. 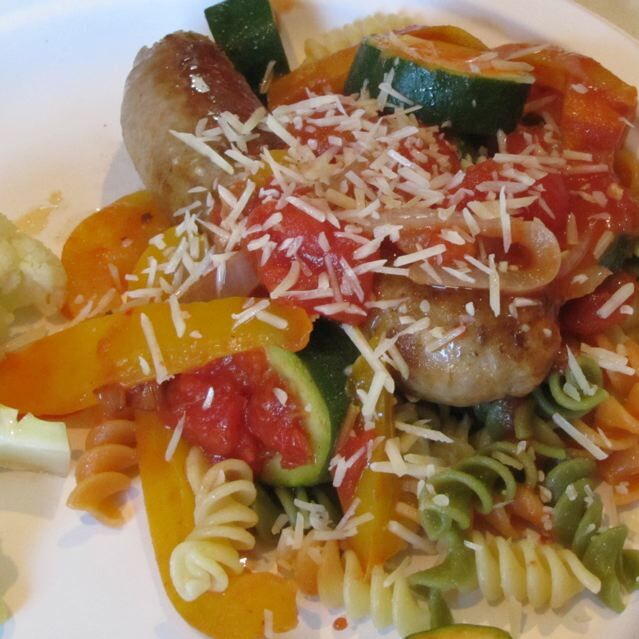 To serve: Top the pasta with cooked sausage and ladle the vegetable tomato sauce over the sausage and pasta. Top with shredded Parmesan cheese. Enjoy! Categories: Main Dish, Main Dish - Pasta, Main Dish - Pork | Permalink. I am a home school mom of three wonderful kids. I have been married for over 20 years and am still in love. I love to cook, as a young child I enjoyed spending time with my mom in the kitchen and that love has grown into a passion. I started this blog to share my favorite recipes with friends and family and have enjoyed seeing it grow beyond those boundaries.